Safe in the knowledge that people are willing to pay good money for vintage sportswear in less-than-perfect condition, some of the sports companies of yesteryear are bringing back some of the old designs, keen to cash in while the going’s good. 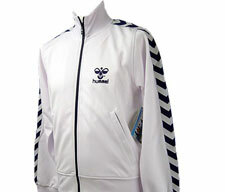 One of these is Hummel, which has brought out a range of tracksuit tops for men and women – including this Hummel Atlantic track top. Made from a cotton/polyester mix for that stretchy feel, it has a full length zip, hand pockets and embroidered Hummel stripes down the arm, along with a logo on the chest. Available in various sizes and colours, it’s likely to set you back around £45. any in clart and amber colours ? ?